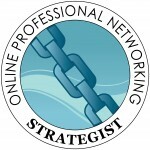 The Online Professional Networking Strategist Program focuses exclusively on LinkedIn keeping you current with the latest job search trends & technologies in the “social search.” It will position you as a cutting-edge career provider!! And it will add an important new revenue stream to your business!!! This class is quickly becoming a “favorite” among our students and alumni. It’s both brilliant and fun! ♦ Surveys show that employers are looking for talent on LinkedIn BEFORE they go to Facebook, Twitter, Job Boards, Search Engines, You Tube, and more! ♦ And, LinkedIn is the #1 tool recruiters use to publish jobs free, get referrals, research candidates, and direct-source candidates (JobVite Inc., 2010). Class meets weekly from 1-2:15 p.m. Eastern for six weeks. The three biggest mistakes job seekers make on LinkedIn -- and how to avoid them. What works -- and doesn't -- in Profiles, Account Settings, Apps, Recommendations, Q&A, Job Pages, Company Pages, and more when it comes to the job search. How to guide your clients to create engaging, keyword-rich, ROI-radiant profiles. Simple tips and tricks to take advantage of advanced search functions. Find -- and connect with -- previously inaccessible company insiders, recruiters, and other influential networking contacts. How to maximize your clients' presence on Groups -- where the hidden job market hangs out. The program is taught via webinar for 75 minutes each week for six weeks. All sessions are recorded and are accessible after the call. The class is taught with a "watch, learn, practice, and apply" methodology. The cost is $647 (installment payment plan of two payments of $347 each is also available if registered before Nov. 4, 2014).